The Catholic Church's opposition to the death penalty places Catholic judges in a moral and legal bind. While these judges are obliged by oath, professional commitment, and the demands of citizenship to enforce the death penalty, they are also obliged to adhere to their church's teaching on moral matters. Although the legal system has a solution for this dilemma by allowing the recusal of judges whose convictions keep them from doing their job, Catholic judges will want to sit whenever possible without acting immorally. However, litigants and the general public are entitled to impartial justice, which may be something a judge who is heedful of ecclesiastical pronouncements cannot dispense. Therefore, the authors argue, we need to know whether judges are legally disqualified from hearing cases that their consciences would let them decide. 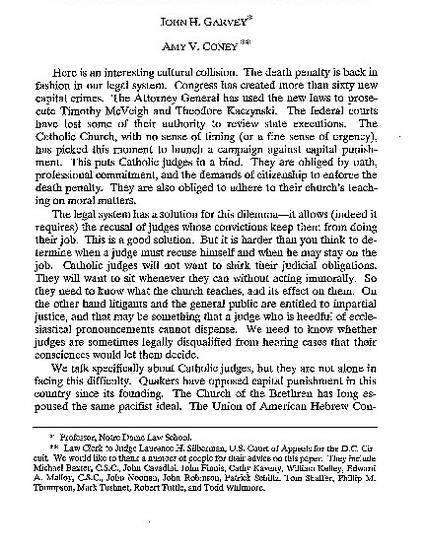 While mere identification of a judge as Catholic is not sufficient reason for recusal under federal law, the authors suggest that the moral impossibility of enforcing capital punishment in such cases as sentencing, enforcing jury recommendations, and affirming are in fact reasons for not participating. Reprinted with permission of Marquette Law Review.